Why is it so important for consumers to be aware of their power? Because it is the only countervailing force that exists in the face of the powerful but destructive network of multinationals, that has the whole world in their clutches. 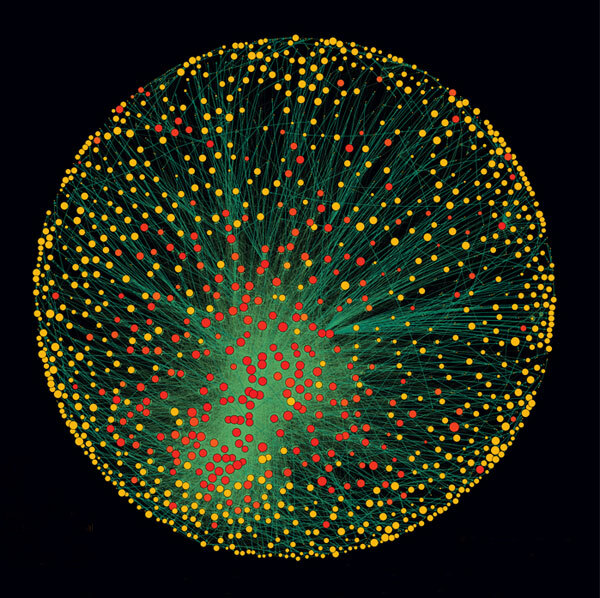 A complex study on the network of control, of direct and indirect ownership in our global economy was published in 2011, revealing 147 top holder TNC’s (Transnational Corporations) at its core. Read the full analysis here or download it here. These corporations have only one goal: increase profits at all cost. They are willing to destroy the environment, poison its inhabitants with toxic chemicals, lay-off employees and relocate production for cheaper labour, etc. We could cite dozens of examples that prove the voracity of neoliberalism in multiple industries: sales of bottled water contaminated with harmful chemicals, sales of hormone-treated meat, full of antibiotics and soaked in bleach at the end of the chain, the use of carcinogenic irritants or endocrine disruptors in most industrial cosmetics, and the list goes on. All of these activities are approved by advisory committees where conflicts of interests are present when members hold their own financial interests on the matters they are advising on. Unfortunately, in the world we live in today, we cannot trust these transnational corporations, or the official authorities who approve of products to be sold in supermarkets, regardless of their known dangers. However, informed consumers can make all the difference that it takes to ensure that the products made available to us are safe and were made in fair conditions, conducive to a richer real economy which benefits the majority. If only a small percentage of us start consuming wisely, and stop feeding the network of TNC’s that control the world, their power would quickly deplete as their shareholders would start breaking away from their web of force, leaving them vulnerable at the core. It only takes 25% of consumers to start an economic revolution! The dirty secret behind the crisis is that THERE IS NO ECONOMIC CRISIS. Over the past few years, we have been repeatedly told to endure austerity, when the truth is, the financial economy has never been richer. It is getting richer because it is exhausting the prosperity from the real economy, under the mask of a euphemism called neoliberalism. If you want to learn where you stand in today’s failing system, then you’ve come to the right article. By reading this, you will realize your power to choose as a consumer, and give way to a new system (constructive capitalism) that can boost the real economy and bring back its balance. For 30 years, we have been witnessing a deregulation of financial sectors, and thus the establishment of an aggressive anarchic capitalism, better known as neoliberalism. As Professor Jodi Dean (Dept. of Political Science in Hobart and William Smith College) puts it, neoliberalism is “that extreme capitalism wherein government pursues policies for the benefit of markets not people”. While the markets benefit, the people are being exploited, and contrary to its claimed intent, the implementation of neoliberalism has NOT fueled the economy. It has only caused rising debts and unemployment. Therefore, there is a strong need to apply a different set of principles in order to refuel the real economy in a mathematical and logical way. This means that there is now hardly any control over these parameters, and that government intervention no longer or hardly exists in these countries’ financial sectors, due to the increasing liberalization of each country’s financial regulations. We observe how economic growth problems started at the same time as when neoliberalism seeped its way into these industrialized countries. As mentioned earlier, neoliberalism was supposed to be put in place in order to “fuel” the economy. Let us take a look at how it has rather failed the economy. To start with, deregulation of the financial sectors is partly to blame for how the average salary is kept at minimum wage. Despite the unprecedented increase in productivity (due to automation and a number of other technological innovations), employees have been denied their entitlement to this wealth, while companies enjoy the liberty to feed it into the fictive economy in the form of stocks and shares (where it benefits mostly themselves), preventing it from naturally flowing into the real economy. Employee productivity has been substantially increasing, but without ever benefitting the hardworking people. Shareholders’ high dividends, along with the excessive salaries of CEO’s, choke the growth of businesses and prevent any growth in the real economy. The emphasis on financial economy and thus the increase on shareholders’ percentages has allowed the wealth from productivity to be distributed in an irrational way, leaving the employees with minimum wages, while the CEO’s and shareholders amass big chunks of the profit. Still, governments continue to tell people that there have been no growth and productivity gains that would justify or allow a raise in wages. However, Table 4 further proves that ever since the start of neoliberalism (70’s), the financial economy has been sucking up the productivity gains and growth in France, keeping its GDP low. More than half of remunerations are based in financial economy (stock options, shares). With the real economy representing just a tiny fraction of the whole economy, we see how there is simply not enough money being invested in the physical means of production; this explains the minimum wages, high unemployment rates and high debts. From this information, we can conclude that the Financial Economy is not only failing to enrich the Real Economy, it is also killing it. This also explains why all industrialized countries have had very weak growth since the 70’s and thus experience troubles with debt. This table shows the percentages of debt belonging to public administration, non-financial corporations and household, in each of the above neo-liberalized countries. Although neoliberalism has used debt as an excuse to favour privatization and liberalization of economy, it has only worsened the problem that it was supposed to help solve. Privatization of public and social services take advantage of public wealth by making it private, while leaving the debt to the people. “What really happens is that public wealth and profit making opportunities get transferred to the private few.” For example, in Canada, “The sale of Highway 407 and the lease of the Bruce Nuclear plant both privatized the profits but kept the debt public.” This clearly shows how privatization of public services is preposterous and just plain abusive. By looking at all the information above, along with supporting evidence of tables and graphs, one can conclude that neoliberalism has played a large role in the creation of debt, in order to create money that would only benefit the financial, or more fittingly, the fictive economy, which favours only the most fortunate. Living in this predatory form of capitalism means that emphasis is put on profit that benefits only a tiny percentage of the population. This emphasis on profits also means that large companies are willing to cheat you by selling you the lowest quality products for high prices, even if producing these items involve harming the environment and risking your health. Neoliberalism has completely failed the economy and has even caused countries to go into deeper debts. A new system is thus imperative to be put in place; a new system with effective solutions. For starters, what you, as a consumer, can do is to stop purchasing from predator companies that keep neoliberalism intact; and start looking for more ethical companies that strive to establish a healthier, more constructive form of capitalism. To facilitate people in making informed decisions about their purchases, this section shares information on 1 of the 3 major categories that are inevitably affected by company policies. This section is dedicated to Economy. Consumers have the right to know about what type of company their products or services come from. We have the power to choose companies that are small to medium sized enterprises (SME’s), who allow the money to circulate in the real economy as they are not in the stock market.